Thanks to the generosity of donors far and wide, Texas Children’s Hospital has reached a significant milestone in its Promise Campaign. As of the end of September, donors had contributed $408.9 million, pushing the organization ever closer to its $475 million fundraising goal. The amount raised during fiscal year 2017 alone – $124.7 million – is a new annual high for the hospital’s fundraising team. This record-breaking year coincides with a rebranding of the team that leads these efforts – the Office of Development is now the Office Philanthropy. 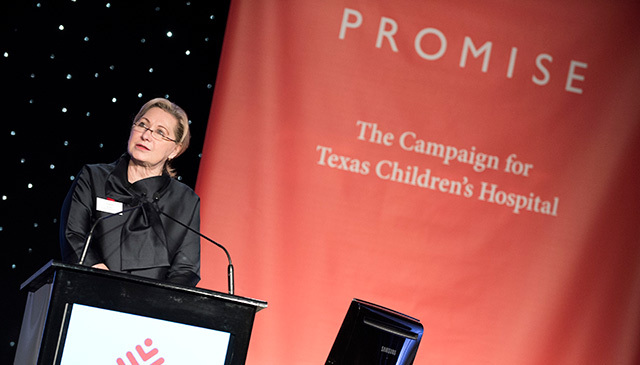 “Changing the name from development to philanthropy better defines what we do, which is less transactional and more about the creation and sustainability of a strong and active base of supporters who are dedicated to advancing Texas Children’s mission,” said Amber Tabora, Senior Vice President of Philanthropy, Marketing and Public Relations. “We are so grateful to our generous donors, volunteers and friends in the community, and to the Office of Philanthropy team, who are all working together to ensure the campaign’s success,” said Michael C. Linn, president of Texas Children’s Board of Trustees. Linn and his wife, Carol, serve as co-chairs of the Promise Campaign, which was launched more than seven years ago. The new Legacy Tower, scheduled to open in the spring of 2018 will add 640,000 square feet of space to our Main Campus, allowing the hospital to respond to an urgent need for the expansion of critical, surgical and cardiac care services. Funding for this area supports the advancement of Texas Children’s mission, providing care for all patients regardless of their families’ ability to pay, bridging the gap for un- and under-compensated care, and providing resources to address the hospital’s most pressing needs. Not a day goes by when Texas Children’s renowned physicians and scientists are not being recruited by other institutions around the world. Funding for endowed chairs enables us to recruit the brightest and best and keep them here. Texas Children’s specialty services are ranked consistently in the top 10 for pediatric hospitals throughout the country. Funding for divisions and centers of excellence like allows us to enhance and expand our existing programs and develop new ones to address our patients’ ever-evolving needs. The 548,000-square-foot dedicated pediatric hospital – our second community hospital – expanded Texas Children’s footprint in The Woodlands to better serve the growing communities north of Houston. The Office of Philanthropy cultivates these partnerships through education, attentive stewardship and appropriate solicitation. The gifts received as a result of this work – no matter how big or small – can be life-changing for our patients, families and staff. For more information about the Promise Campaign, click here.